Reminds me of my dad. Ah, I miss him. LaMarr: He just left his baby with two drunk dudes. Malloy: Reminds me of my dad. Ah, I miss him. 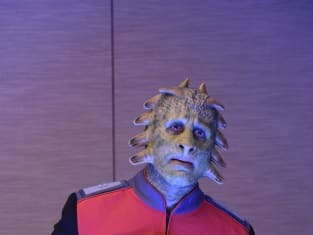 The Orville Season 1 Episode 3: "About a Girl"
Yaphit: And then there's this cough. *cough* *cough* right? Dr. Finn: You don't have lungs which means you don't have a cough. Yaphit: Oh, I'm pretty sure there is, doc. I haven't been retaining fluids like I usually do. My quarters look like a swamp. It's a mess.